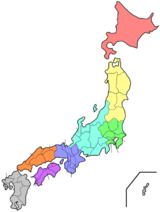 The Chūgoku region (中国地方, Chūgoku-chihō), an aa kent as the San'in-San'yō region (山陰山陽地方, San'in san'yō-chihō), is the wastrenmaist region o Honshū, the lairgest island o Japan. It consists o the prefecturs o Hiroshima, Okayama, Shimane, Tottori an Yamaguchi. As o 2010 it haes a population o 7,563,428. ↑ 1.0 1.1 Ministry of Internal Affairs and Communications Statistics Bureau (26 October 2011). "平成 22 年国勢調査の概要" (PDF). Retrieved 6 May 2012.